Focus Home Interactive has announced partnerships with 12 game studios at the company’s annual press event, What’s Next. Three of the games also involve partnerships with Games Workshop and are set in the Warhammer universes. 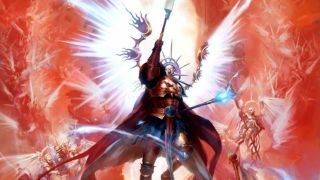 Focus did not reveal the titles for the Warhammer games it has in development, but there are a few hints to go on. Vancouver-based Gasket Games is working on an Age of Sigmar title, and the studio includes developers who previously worked on real-time strategy games like Dawn of War and Homeworld: Deserts of Kharak. It seems likely they're working on another strategy title, and the artwork features a golden-armored member of the Stormcast Eternals. Streum On Studio is working on a shooter, set “in one of the most popular Games Workshop IPs,” Focus said in its announcement. The teaser art features the words “Descend, assassinate, collect” over an image of a man who may or may not be a member of the Inquisition in Warhammer 40,000. Finally, Spintires developer Saber Interactive is creating a Warhammer 40,000 game as well, indicated by the twin-headed Imperial Aquilia symbol in the teaser artwork. It’s accompanied by the words “Protect, redeem, purge,” which sounds appropriately Warhammer. Focus also announced it will be continuing its partnership with Deck13 Interactive, the developers behind The Surge and Lords of the Fallen. They’ll be starting work on a new series after they launch The Surge 2 later this year. Focus Home Interactive will also be partnering with Chaosium, and have brokered a deal to be the exclusive publisher of video games set in the Call of Cthulhu RPG universe. You can check out the full set of announcements here.